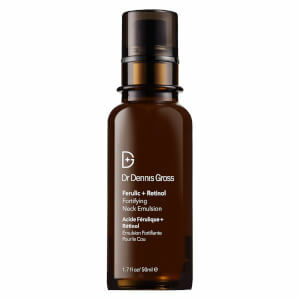 Target loose skin at the neck, chin and jawline with the Dr Dennis Gross Ferulic and Retinol Fortifying Neck Emulsion; a fast-absorbing formula that helps to firm, smooth and rejuvenate skin suffering from loss of elasticity. Effortlessly smoothing over the neck, the rich emulsion utilises a proprietary blend of proven actives to reduce the appearance of creepiness. 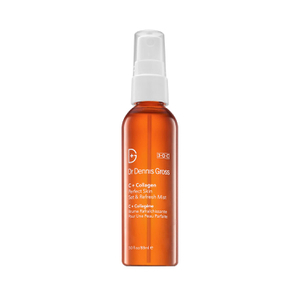 The treatment is enriched with Ferulic Acid, Retinol and Silk Amino Acids, which work in synergy with Dr Dennis Gross’ innovative ECG Complex™ to restore skin’s foundation and renew and re-texturise the surface of delicate skin. The Ferulic and Retinol Fortifying Neck Emulsion treats skin to a veil of moisture, whilst also protecting against environmental damage. With continued use, expect skin to appear smoother and more supple. Water/Aqua/Eau, C12-15 Alkyl Benzoate, Glycerin, Lactic Acid, Behenyl Alcohol, Isopropyl Palmitate, Octyldodecanol, Dimethyl Isosorbide, Methyl Methacrylate Crosspolymer, Helianthus Annuus (Sunflower) Seed Oil, Sodium Hydroxide, Dimethicone, Glycolic Acid, Propanediol, Beeswax, Cetyl Alcohol, Hydrogenated Lecithin, Palmitic Acid, Butylene Glycol, Ferulic Acid, Ellagic Acid, Gallic Acid, Collagen Amino Acids, Silk Amino Acids, Sodium Hyaluronate, Retinol, Zea Mays (Corn) Silk Extract, Phospholipids, Sphingolipids, Saccharide Isomerate, Leuconostoc/Radish Root Ferment Filtrate, Glycine Soja (Soybean) Oil, Ascorbyl Palmitate, Tocopherol, Urea, Sodium PCA, Mannitol, Citrullus Vulgaris (Watermelon) Fruit Extract, Xanthan Gum, Caprylyl Glycol, Acrylates/Carbamate Copolymer, Caprylic/Capric Triglyceride, Magnesium Aspartate, Zinc Gluconate, Copper Gluconate, Ethylhexylglycerin, Acrylates/C10-30 Alkyl Acrylate Crosspolymer, Disodium EDTA, Citric Acid, Sodium Citrate, Hexylene Glycol, Citrus Aurantium Bergamia (Bergamot) Fruit Extract, Citrus Limon (Lemon) Peel Extract, Lavandula Angustifolia (Lavender) Flower/Leaf/Stem Extract, Phenoxyethanol, Potassium Sorbate, Annatto.